Have you heard of Circle Time? It's a concept I've tried to use in my homeschool, without having a name for it. It's a time when you gather all your children, and do some things together. My girls and I have been doing this for the last couple of years. We sit together and go over our daily Bible reading, memory work, and whatever books we we're reading together. Then, I send them off to do their independent work while I keep my son from destroying the house do some fun educational activities with my 5-year-old. I want to include the little man. With a large age difference between him and my younger daughter - six and a half years - I haven't been able to see how I could make it work, though. I was intrigued by the opportunity to review the Circle Time e-book from Preschoolers and Peace, written by Kendra Fletcher. I have read her blog often over the years, and gotten tons of ideas to use with my children. I hoped to find inspiration on how to include Isaac in our morning together times, and I was not disappointed. If there's one thing I've learned as a parent (repeatedly; one would think God really wants me to pay attention to this) it's that I need to be flexible. What works for one child, one moment, may not work for the next child - or in the next moment, for that matter. I don't know why I've been so stuck on what our Circle Time must include, but I've been quite set on doing specific things with the girls and letting Isaac wander off and do his own thing. That hasn't worked particularly well. I want Isaac to be able to participate, too. I think Circle Time will allow that, once I find the right components. In fact, just recently we were reading a book called Tunnel of Gold by Susan Marlow (review here), and Isaac asked each day if we could read it again the next day. The girls enjoyed the book too, which told me that it would indeed be possible to come up with Circle Time activities that we would all enjoy. This book is full of encouragement and ideas. Kendra gives lots of suggestions for including each child, from oldest to youngest. She has 8 children from teens to toddlers, and she shares ideas from two other moms of several children as well, so you can see how their versions of Circle Time work. 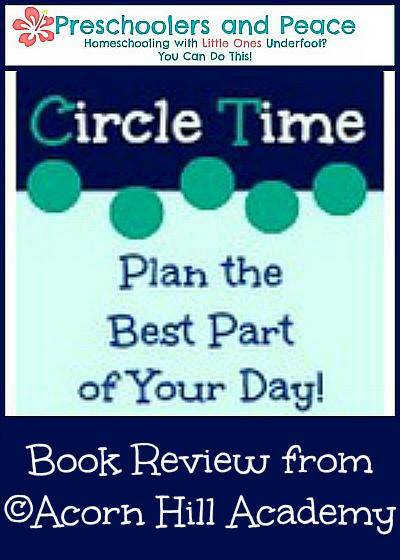 There are several questions answered, from moms who want to incorporate circle time in their day but wonder how to make it work in their particular situation. Circle Time is a quick read at just 33 pages. It's not a curriculum; Kendra gives lots of ideas for what you might include, along with pictures of they things she does with her own children (very helpful). She has some printables, too, that will help you with your planning. She provides links to resources she mentions using, as well as to Circle Time posts on her Preschoolers and Peace blog and the Circle Time Pinterest board. 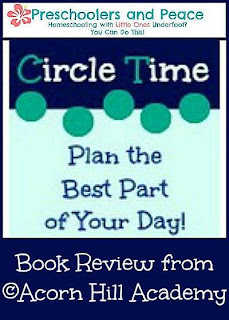 This is a great resource for anyone looking to make Circle Time a part of their homeschool day. The Circle Time ebook is available for $4.99 from Preschoolers and Peace.